I feel 26 pounds freer. 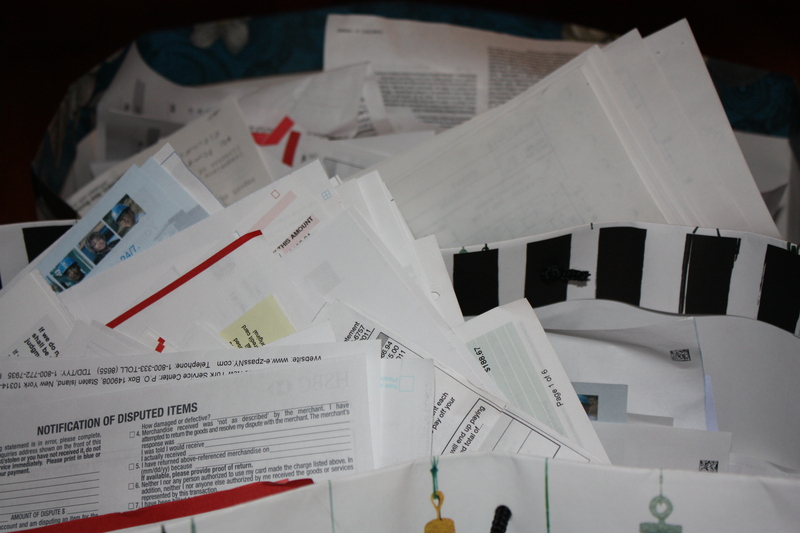 I don’t have a good filing system. In addition to the pile of important and confidential documents dessicating in the milk crate in the basement, I have two piles in the front hall requiring immediate attention, piles of bills to be paid, recipes I want to cook, yoga lesson plans for my Thursday night class, newspapers and magazines with articles I am dying to read, but probably won’t before I give up and toss them into the pile of recycling. Another two piles are hidden inside the beautiful chest in our front hall that my husband thought might inspire us to organize some of our clutter in. Another six or seven (or twelve) piles surround the floor in our office/guest room that is now so cluttered that it cannot be used for either purpose. A poor guest would be buried by the pile of clothes-to-be-donated that are sitting in purgatory on the futon bed. The problem with this organizational strategy is that when I actually need to find something, like the yearbook order form for my daughter’s 12th grade yearbook (important!!!) or some obscure document for the annual tax filing ordeal (coming up!!! ), it takes me hours of hunting through the various piles to find what I am looking for. Or worse, my husband decides he needs something that has ended up in one of these piles and curses disbelievingly at how disorganized we are. Yeah, like it’s a surprise. We’ve been disorganized together for 20 years now. Neither one of us likes to spend time on organizing. Somehow our lack of organization is always the other’s fault. He keeps stuff because We-Might-Need-It-Someday or It-Still-Works. I am more willing to throw things away, but I don’t because it takes time and decision-making and I have better things to do (like Achieve Greatness). I am paralyzed by filing, unable to decide what categories to create. The daughter of a hoarder and organizer-by-piling, I never learned any other way. My father’s office was off limits because well, I am not sure why. Forbidden because he didn’t want us to see what was there or forbidden simply because he wanted to control that space? Under no uncertain terms was anyone allowed in that room. It was a mess. Piles of stuff that he wanted no one touching. During a recent visit, there were 7 empty mouthwash bottles in the bathroom. I know he had a good plan for using these bottles, but it was bordering on pathological (and laughable if it weren’t so sad). He has hired a de-clutterer to help him. I have suggested therapy, but I think it is too late. He is increasingly overwhelmed with all his important-to-him make-work paper-work. Perhaps his plight is behind my somewhat sudden and intense desire to free myself of clutter and attempt to become more organized. I am terrified of ending up like him, obsessively and compulsively spending time on stuff that is not very important or not very effective, while ignoring housekeeping tasks or undervaluing the impact of a streamlined living environment. I have always been drawn to modern simple de-cluttered spaces depicted so beautifully in home magazines, so foreign to how I live, begging the obvious question: Where do they keep their stuff? Sure, there is a lot of stuff when you are an active family of four, but couldn’t we do with less stuff? Isn’t it time to shed what we don’t need? Especially as my daughter prepares to leave for college and we become a household of three. Do we really need the toy room? Perhaps it is time to shed what no longer serves me. Creeping up on me quietly has been a desire for a serene room in which to write. The beauty of the laptop is that I can write anywhere. I usually write in the heart of the house where all the activity is, in the kitchen/family room area. The parakeets are chirping and hopping on the keyboard, the tv is on, the kids ask for homework help, my husband practices guitar. It is NOISY. But I am not home very much so I like being accessible and I like being with my family. Usually, I can focus and write amidst the activity. But sometimes, like when I am working out a theme that might require some brave exposure and I want to do it respectfully, I need some peace and quiet. Just what an office might provide. Oh yeah! I have an office! It just happens to be a junk room. Some people have junk drawers, we have a junk room. I quietly and gradually have decided that I need that space to be peaceful, clean, organized, and quiet. I need to get rid of the junk, the clutter. It’s a daunting task, that I expect will take me the year. Or more. But, gradually, I hope to shed the old stuff I don’t need, streamline the stuff I want to keep, and create an open and inviting haven where I feel calm and focused. Who knows, maybe it will even become a space where guests feel welcome. We have a junk room – or two – or three. Like you, I could throw things out and my husband is the keeper of all-that-may-be-important-someday! So what do I do? I get rid of a whole lot of junk when he’s away, but its hard to do that with the furniture pieces. Paperwork, I have no problem with and he never asks for it. LOL!